In the first good news since the Love Actually reunion, Tyra Banks has one last photo in her hands and it represents that she’s returning to her roots as hosting America’s Next Top Model. Set your DVR now. So what brought us this blessing? Well, like every sorority president who comes back to visit the year after she graduates, Tyra Banks was not at all impressed with Vh1’s version of America’s Next Top Model. This is now the second time a Rita Ora feature attempt has gone horribly wrong (see: “Black Widow” with Iggy Azalea). If you need a quick history lesson: ANTM was cancelled by The CW in 2015 after 22 seasons (let’s pray SVU lasts that long) and purchased by Vh1. For the first season of the new and not-so-improved Top Model the judges were people you’ve never heard of and Ashley Graham. 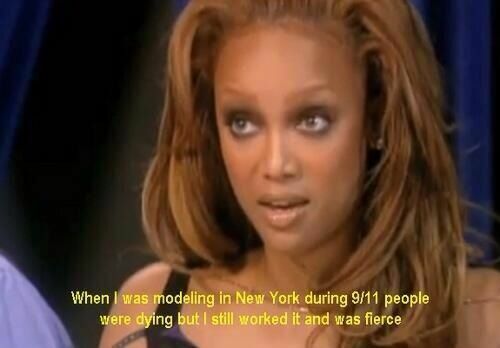 So to celebrate Tyra “Smize” Banks’ return to the show that inspired way too many photo shoots with your friends in middle school, here our her most memorable quotes from the OG series. Though we highly recommend you cancel your weekend plans and go back and revist these iconic moments yourself. Is it, Portis?!? Is IT?!?! So brave. So fierce. How does she not have a Medal of Honor? I say this to myself in the mirror every day before I leave the house. Umm well I’ve been watching ANTM for the last five hours so yeah, I think I have some idea. Scream this at my boyfriend anytime he questions me. The perfect lower back tattoo. Anyone who says they haven’t heard this exact line in the bedroom and privately thought of Tyra is lying. Literally all of us when we found out ANTM was moving to VH1 and replacing Tyra with Rita Ora.